KODIAK COLA is a full-bodied carbonated soft drink for serious cola drinkers. Kodiak Cola holds carbonation for a longer-lasting cola experience. Every mouthful is a big, bold beverage adventure. Rich and dark cola color, but with the clarity of a clear mountain stream. Our precise blend of cola, vanilla, cinnamon, and citrus deliver a sweet, never bitter, beverage that consistently outscores the national cola competitors in sensory attribute testing. Kodiak Cola is micro-brewed using purified water in small batches. Always consistent, always pure. 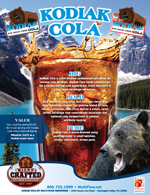 You could be saving $0.05 - $0.10 per serving with Kodiak Cola versus National Brands. PREMIUM TASTE at a Kodiak-sized value!